How often does it happen that a full garbage bag gets torn as you try to tie it up or carry it to the bin? How often do you find smelly leaks in the bottom of your bin? If the answer is ‘never’, then you probably use SANITAS garbage bags! 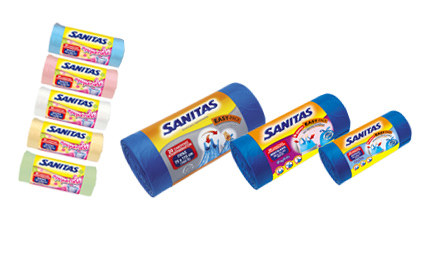 Thousands of households use the SANITAS Classic Garbage Bags daily, as they guarantee protection from leaks, punctures, drawstring breaks, etc. • Small Easypack with handles, 50 Χ 55 cm. (30 Lt) – 20 bags/roll. • Medium Size with draw tape, 52 Χ 60 cm. (35 Lt) -10 bags/roll. • Large Size with draw tape, 52 Χ 75 cm. (45 Lt) - 10 bags/roll. • Large Easypack with draw tape, 58χ75 cm. (60 Lt) - 20 bags/roll. • Gigas with draw tape, 70 Χ 95 cm. (100 Lt) - 8 bags/roll. • Gigas Easypack me wave top, 75 Χ 115 cm. (160 Lt) - 20 bags/roll. • Garden with draw tape, 75 Χ 100 cm. (120 Lt) - 5 bags/roll.